Major League Eating: The Game; the ultimate chomp-off is about to begin. Grab your Wii Remote controller and dig into 12 different foods as you compete against the greatest major-league eaters in the world. This isn't just a race to stuff your face-you'll need strategy to master a smorgasbord of digestive attacks, defenses and counters. These include the Mega Burp, Gas Attack, Antacid and more. And don't forget to keep an eye on your Barf-O-Meter, because if the food hits the plate twice, you're out. Unlock more than 10 characters in single-player career mode, go gut-to-gut against your friends in versus mode, or compete online using Nintendo Wi-Fi Connection. Online play supports friend codes, random matchmaking and leader boards. 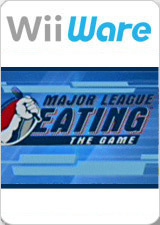 The graph below charts the compatibility with Major League Eating: The Game since Dolphin's 2.0 release, listing revisions only where a compatibility change occurred. This page was last edited on 15 January 2018, at 05:00.